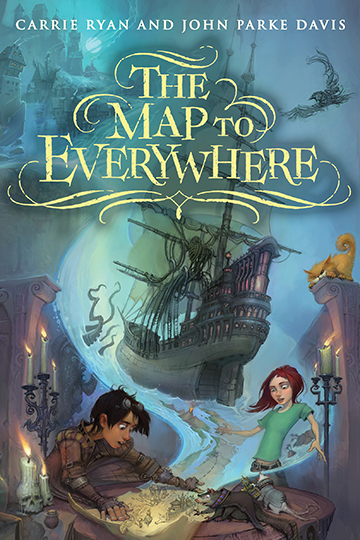 I recently finished The Map to Everywhere by Carrie Ryan and John Parke Davis (these two know how to write a book). It's book one in The Map to Everywhere series, so make sure you read this one first. In the novel, the actual Map to Everywhere is a collection of artifacts that when combined becomes a map that takes you anywhere you need to go. 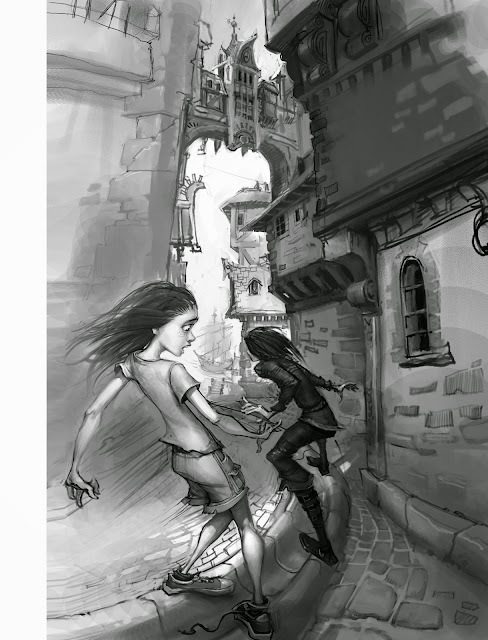 In the Pirate City, Khaznot Quay, Master Thief Fin is a boy cursed with being someone who no one remembers. (Literally, if a person stops thinking about Fin, even for an instant, he or she forgets everything about him.) The only person who ever did remember him was his mother, who had given him up at an early age. Right before they bid each other farewell, she told him she’d always keep him in her heart. He has since made it his mission to find her. Meanwhile, Marrill is a normal girl who just moved to Arizona. Marrill (by some mistake) winds up meeting a quirky wizard and an extremely young captain and is whisked away along the Pirate Stream--a magical ocean made of pure creative essence that connects a multitude of worlds. In order to reunite with her family, she must find all the pieces of the Map to Everywhere. But these characters aren't the only ones searching for the Map. Serth, a dark wizard gone mad, has set out to get his hands on the Map and bring destruction upon all the worlds. Besides our own world, there are a multitude of other worlds much closer to the Stream (worlds that are more connected to each other than our own). What’s fascinating about this series is all the little world building details. The novel introduces these worlds in interesting, subtle ways, especially because we get to see the story told through Fin’s and Marrill’s eyes (thus, we get an outsider’s perspective in one chapter then a much more informed perspective in the next). Each chapter is graced with at least one image of what’s to happen in that chapter. These images are captured with just the right amount of emotion and movement. Plus, the pictures are perfectly placed and don’t give too much away. Even the character designs are believable! Sure, they influence how I see the characters, but usually I’m not too impressed with middle grade illustrations. I was surprised I enjoyed them so much and thought they contributed a lot to the story. Speaking of characters, they're all colorful and multi-dimensional. Marrill isn’t whiny or needy (hooray!). In fact, she comes up with creative solutions to problems. She’s a wonderful asset to the crew, plus she’s intelligent and resourceful. Fin brings the sass. He’s quick-witted and a true survivalist. Even though people forget him all the time, it's well done (I was surprised they were able to pull it off without slipping up). Since he grew up a thief, with no friends or family, his actions are believable and true to how a character in his position would act. It’s also great to see how he develops. 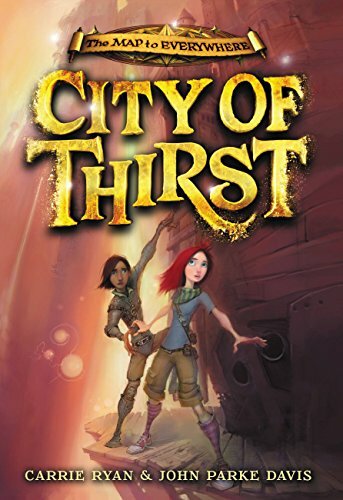 Even the side characters like Ardent and Coll have much deeper personalities and backstories to them. Have you read The Map to Everywhere? Have any middle grade suggestions for me?